Get in the Halloween Spirit, and join us in our 2nd year! Registration is FREE! We encourage businesses, churches, clubs/organizations and classrooms (and families) to enter - A prize will be awarded for the best-dressed cars. Trunk-ers are asked to provide goodies for 250+ children. A hot dog meal will be delivered to you at your trunk. We are also collecting candy donations to supplement and distribute as needed during the event - Please drop off any donations at the JP or CT offices. 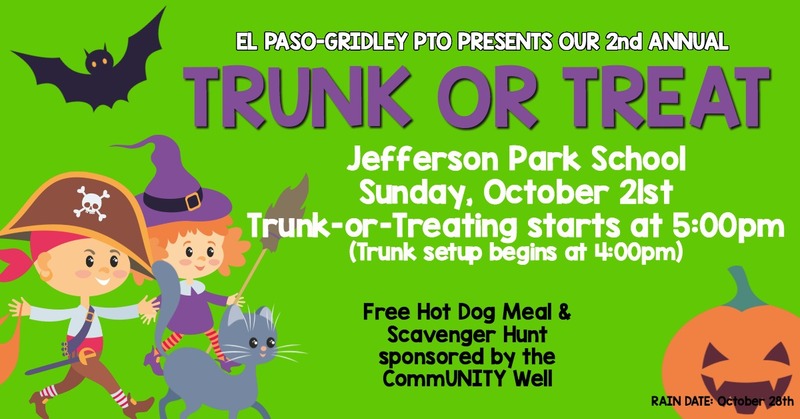 Please visit our Trunk or Treat page for more information. ​We appreciate your support! We were able to fund over $14,000 in teacher requests for the 2017-2018 school year! ​​This exciting program continues in the 2018-2019 year. Did you know that classroom teachers spend an average of $500 per year out of pocket? Now, you can win a teacher a $100 grant! Winners are drawn monthly and can be nominated at any time. Our September winners will be drawn Friday, October 5th. Hurry and Nominate now! Conferences are Tuesday, October 16th, and Thursday, October 18th. There are many spots available for those wanting to help provide nourishment to our teachers during these busy nights. Thank you for participating in the Great American Catalog fundraiser! Over 50% of our funds come from this sale. Product pickup is November 1st, and order payment is due November 15th. Online orders may be made throughout the year - our organization number is 1094770. Next Meeting: Monday, October 8th. Use the Link doors at Centennial and join us in the cafeteria this month. Everyone is always welcome! Send a note on the Contact Us tab if you have any questions!